The beginning of a new year is a time to both reflect, and to look ahead. 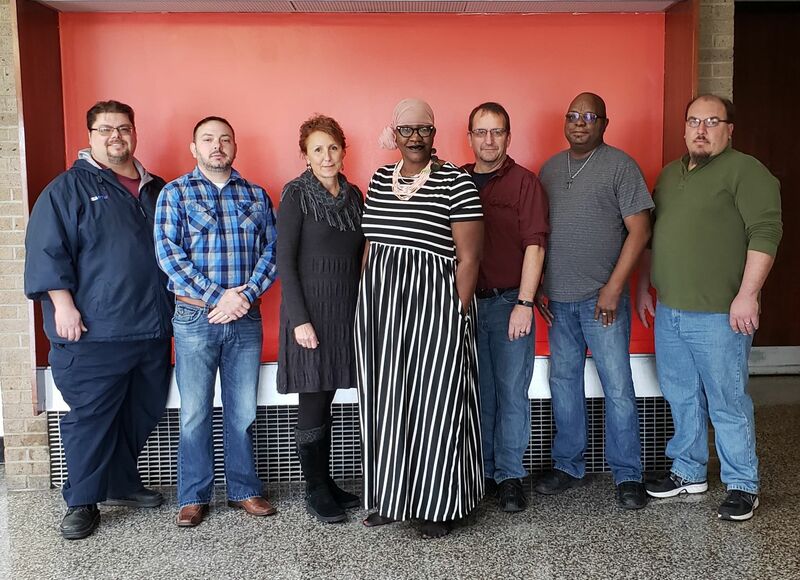 Working together AFSCME Ohio Council 8 members faced and overcame many challenges in 2018. And for that we are grateful. In the coming year our union will continue to fight for dignity on the job. AFSCME members will be working every day to insure our livelihood is protected, that we are safe at work, and that our contracts are respected by management. In 2019, we expect the efforts by the far-right wing to weaken our union will continue. We will see this on the job, in the courts, in the political arena, and at our front doors. In unity there is strength. Standing together as AFSCME Ohio Council 8 members, we are prepared to effectively deal with the issues that lie ahead. On behalf of the officers and leaders of AFSCME Ohio Council 8, I wish you and your family all the best for a happy, healthy New Year. 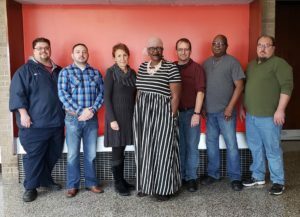 A united membership and a committed negotiating committee won AFSCME Local 1880 a successor contract with the Stark County Area Regional Transportation Authority (SARTA). The agreement, which included wage increases and benefit improvements, was overwhelmingly approved by union members. The three-year contract calls for 3 percent across-the-board pay increase in each year of the agreement. In addition to the percentage increase, the contract included a 40-cent-per hour equity increase in the first year and a $1,000 signing bonus. With SARTA being one of only a handful of transit systems fueling busses with hydrogen, its Hydrogen Mechanics received a $3 per hour equity increase due to the more dangerous work environment and the special skills needed to maintain the vehicles. The union also made significant improvements in health care benefits. The union was also able to maximize the cost-effective vision, dental and other health care services provided by the Ohio AFSCME Care Plan. According to Daum, the union “finally got a foot in the door” on sick leave. In the absence of actual sick leave, members will now be able to convert up to 3 days of vacation in case of an illness without going through the usual approval process, “and that’s a start,” he said. AFSCME Local 1091 members held a “Breakfast with Santa” community service event to raise money for the Paint Creek Joint EMS/Fire District. The 16-member union will use the money to buy hand tools and equipment and to help the Hillsboro community with fire prevention awareness. “We’re trying to raise money so we can buy things we usually pay for out of our own pockets,” said AFSCME Local 1091 Steve Vance. 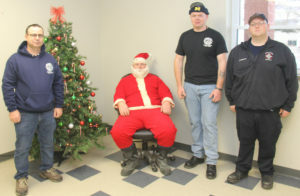 The union is only three years old and is one of a handful of new unions organized by AFSCME Ohio Council 8 representing part-time paid volunteer firefights around Ohio. Tyler Coleman and Brandon Robinson. 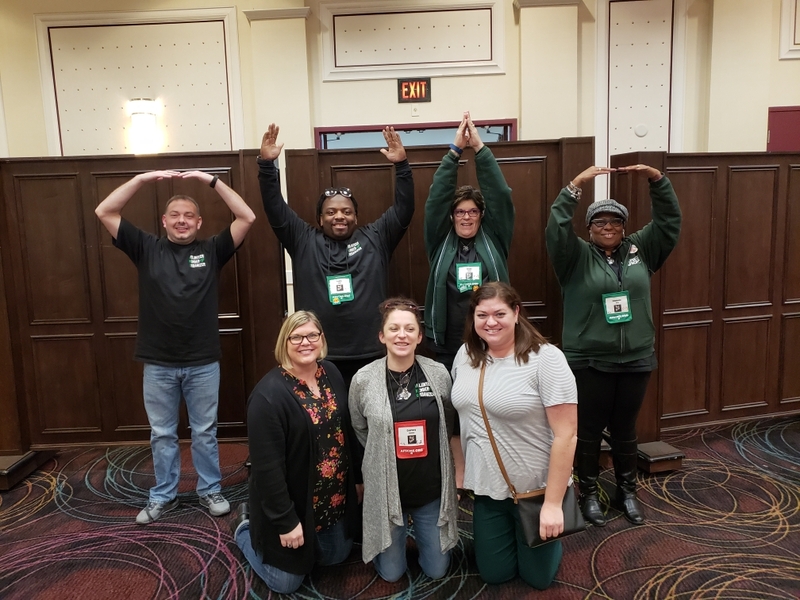 Ohio Council 8 members joined more than 160 AFSCME members from around the country who gathered in Las Vegas last week to lift up the voice of public service workers and move our union forward. “No one is better than a union member to explain the benefits of joining and belonging to a union. 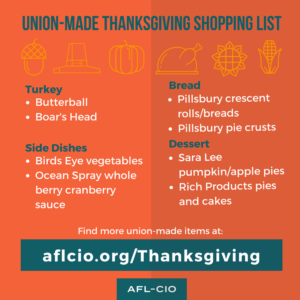 That’s why VMOs are so effective organizing new members and in internal organizing,” said AFSCME Ohio Council 8 Organizing Director Steve Roth. Conference attendees participated in skill-building training sessions as well as gaining practical organizing experience. Leaving the classroom and hitting the streets, VMO’s knocked on the doors of Nevada state workers in anticipation of a pro-union administration by the state’s new Governor. In addition to Shoemaker, Council 8 members Kelly Bennett of Dayton, Keava McLoughlin of Columbus, Marilyn Fletcher, of Toledo, Quanna Murphy and Linda Wilson of Cincinnati, Shawn Daum of Akron, and Tina Brown of Athens, attended the conference. 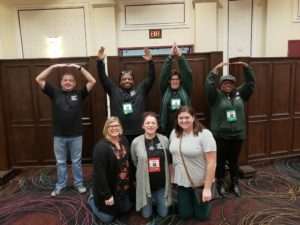 AFSCME Local 2191 President Jamie Shoemaker, first row left, joined by other O-H-I-O AFSCME members at the International Union’s Las Vegas VMO conference. AFSCME Council 8 is standing strong with workers in Lordstown, Ohio as they fight to keep the General Motors Lordstown Complex running and save the countless jobs that rely on the complex. Drive It Home Ohio is a collaborative effort bringing together the Youngstown/Warren Regional Chamber of Commerce and UAW local 1112, along with local business, community and religious leaders, workers, consumers and their families, to urge General Motors to support growing their investment at the Lordstown Complex. We build cars in northeast Ohio and those jobs build our economy in the region and all across the state. Drive It Home will grow jobs in the Mahoning Valley, protect manufacturing jobs in our state and ensure that American cars are made in the United States. American-made cars should be made in America. No more outsourcing jobs and leaving American workers behind. Join us in supporting the efforts of Drive It Home Ohio and the workers in the Mahoning Valley. They have been loyal, hard working dedicated members of the GM Family for 52 years and we need to remind GM and the world that you don’t turn your back on family. Find Drive It Home Ohio on Facebook and Twitter and like and follow their pages to show your support! 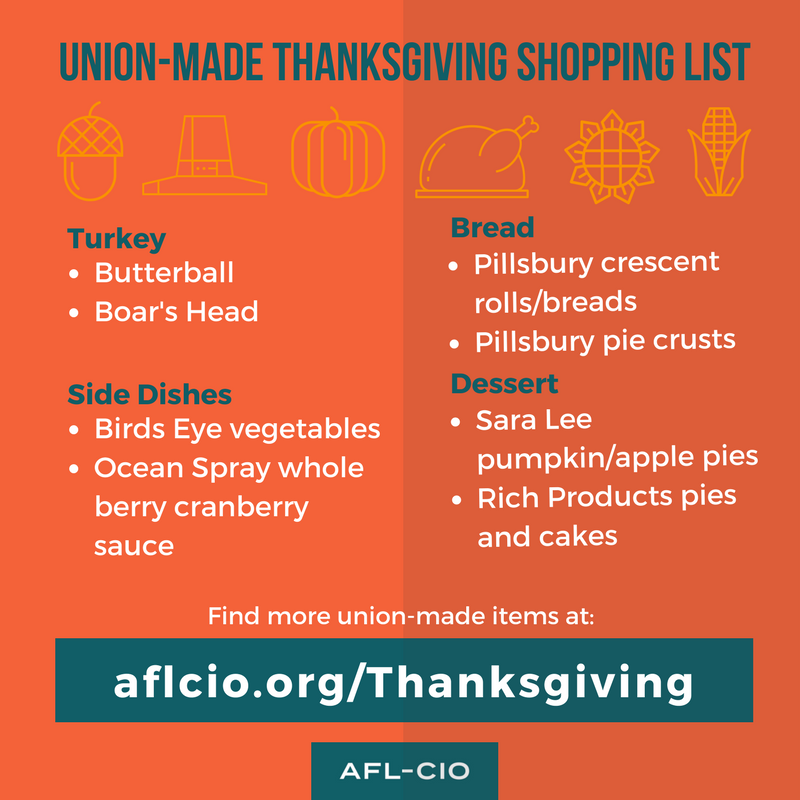 Check out this helpful guide to shopping union-made this Thanksgiving. That’s something we can all be thankful for! Watch this video and see why Ohio workers are fighting back against dangerous right to work legislation. Don’t let legislators take away your voice. Fight back! 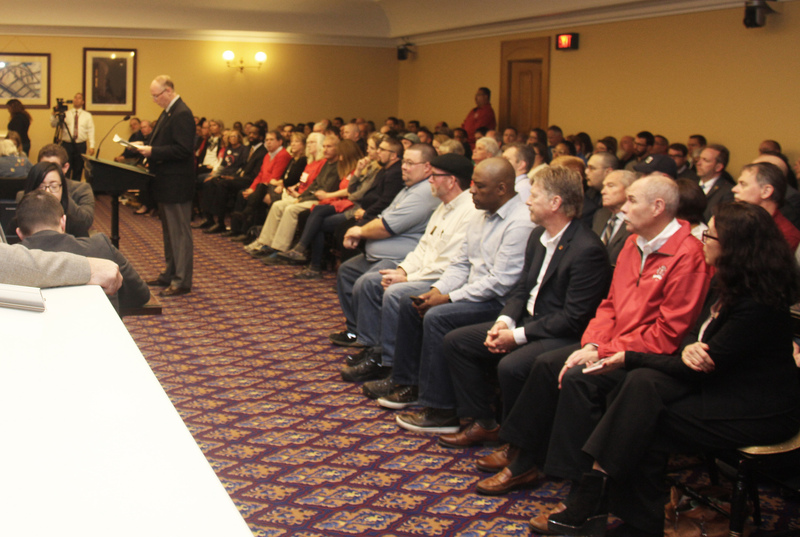 Union members overflowed the House Finance Committee hearing room for the first reading of HB 53, a controversial “Right-to-Work” bill aimed at Ohio’s public employee unions. The bill’s sponsor, Rep. John Becker, a Clermont County Republican, had little to offer when questioned about the need for the bill and what effect it would have on unions. The bill “would not change anything” he said. In fact, it would change everything public employees have gained since the 1982 passage of Ohio’s public employee collective bargaining law. When challenged by committee members to explain how Ohio would be different than other right-to-work states where pay has plunged and workplace injuries have skyrocketed, he said he didn’t know. Right-to-work laws commonly allow members to stop paying union dues while still enjoying union representation, creating a so-called “free riders” problem. Becker’s bill supposedly solves this by wiping out exclusive representation. Under HB53, unions would be prohibited from representing non-members. Experience has shown that giving up exclusive representation is a trap. While it may address “free riders”, it’s a divide-and-conquer tactic that ultimately weakens a union’s power to win better pay, stronger pensions, and job security. It’s not clear if Ohio’s GOP-controlled Legislature is on board with restricting labor rights during its lame-duck session. Many members recall SB5, a similar law voters soundly rejected by a 62 percent margin in 2011. “All of labor is watching this closely and we are ready to act if HB53 picks up any steam,” said AFSCME Ohio Council 8 Political and Legislative Director Robert Davis, who advised all AFSCME members to remain engaged and informed. If enacted, Ohio would become the 29th state with union busting laws on the books, including neighboring Michigan, West Virginia, Kentucky, and Indiana. AFSCME Council 8 President John A. Lyall of Powell (Delaware Co.) has been appointed to the Industrial Commission Nominating Council by Governor John Kasich for a term beginning November 9, 2018, and ending October 20, 2022. John A. Lyall has served as President of AFSCME Ohio Council 8 since 2007, and was unanimously elected to a third four-year term in 2015, at AFSCME Ohio Council 8’s 21st Biennial Convention. President Lyall is a native of Cleveland and first joined AFSCME as a member in 1973, when he went to work for the City of North Olmsted. In 1979, he joined the Cleveland AFSCME staff. He worked as an assistant administrator with the Ohio AFSCME Care Plan, as an organizer, and staff representative. John Lyall was appointed Cleveland Regional Director in 1991. In 1996, he was elected head of the Cleveland Federation of Labor AFL-CIO, now the North Shore Labor Council, and served as President until 1998. In 1999, he moved to Columbus when he was appointed Council 8’s first Organizing Director, and in 2001, became the union’s First Vice President. He serves as an AFSCME International Vice President and serves as chairman of the AFSCME Ohio Council 8 Care Plan. In addition, he serves as a vice president on the Ohio AFL-CIO Executive Board and is a member of the Ohio AFL-CIO Executive Committee. Lyall is also a member of the State Executive Committee of the Ohio Democratic Party. John Lyall graduated from Baldwin-Wallace College with honors and completed the Harvard University Trade Union Program. He has been married 28 years and has three children. The U.S. Sixth Circuit Court of Appeals just halted Ohio Secretary of State Jon Husted’s purge of the state’s voter rolls. The ruling handed down yesterday, allows Ohio voters who had their registrations cancelled to cast provisional ballots in the Nov. 6, 2018 election. The case led by the A. Philip Randolph Institute lost its claim that Ohio’s purge of its voter lists was unconstitutional when the U.S. Supreme Court ruled in favor of Ohio’s right to “clean up” its voter lists. But they continued to challenge the use-it-or-lose-it process that kicks out the voter registration of anyone who has not voted in the last three federal elections. Ruling there wasn’t an emergency need to block “purges,” the 6th Circuit Judges said it could consider that part of the appeal later. If you believe your voter registration was revoked, you can go to the polls, re-register and cast a provisional ballot during early voting or on election day.